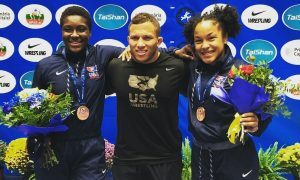 The U23 World Championships have concluded from Bucharest, Romania after the medal round matches in the final five weight classes have been settled in men’s freestyle. Both Americans in action Sunday fell in the world finals, which brought the US men’s freestyle team medal count up to three, all of which are silver medals. Yesterday, Ohio State’s two-time All-American Kollin Moore (97 kg) brought home the first silver medal for the red, white, and blue. Moore fell 10-0 in the finals to a familiar foe Givi Matcharashvili (Georgia). Last year, in the semifinals of the Junior World Championships, Kollin also lost by a tech to the Georgian. Just to make it to the finals, Moore needed a furious comeback down 8-2 to Magamed Zakariiev (Ukraine), a lead which he quickly erased in 10 seconds to lead, then win 10-8. Moore’s tournament started with a hard-fought 6-5 win over Igor Ovsiannikov (Russia), the eventual bronze medalist. He then would proceed to tech his next two opponents, without much difficulty. The silver medal is Moore second world medal, as he won Junior bronze last year. This was Kollin’s third trip to a world championship event. The most unlikely medalist for the American team was NC State’s Sean Fausz (61 kg) who made the U23 world finals after finishing fourth at the world team trials. Sean was named to the team after Vito Arujau (Cornell) withdrew due to an injury. The biggest hurdle for Fausz en route to the finals came in the semi’s when he came out on the right side of a 2-0 nailbiter to Iman Sadeghikoukandeh (Iran). He fell in the finals to Magomedrasul Idrisov (Russia) 11-1. This tournament was the first world team for the Wolfpack 125 lber. The last medalist for the US was Youssif Hemida (125 kg), who also won world silver. The Maryland All-American was stopped in the finals by Said Gamidov (Russia) who pinned Hemida when the Terp heavyweight went upperbody with the Russian. In Hemdia’s three wins during his run to the finals he pinned a 2018 Junior world bronze medalist Samhan Jabrailov (Moldova) in the quarters, the knocked off a European fifth-placer Ronaldi Andriadze (Georgia) in the semis. 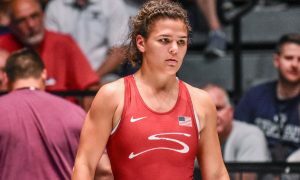 The only other member of the men’s freestyle team to wrestle for a medal was Jack Mueller (57 kg) of Virginia who was on the wrong side of an 11-9 shootout against Wanhao Zou (China) in the bronze medal match.